I will be making two of these posts, one in Finnish and the other in English. 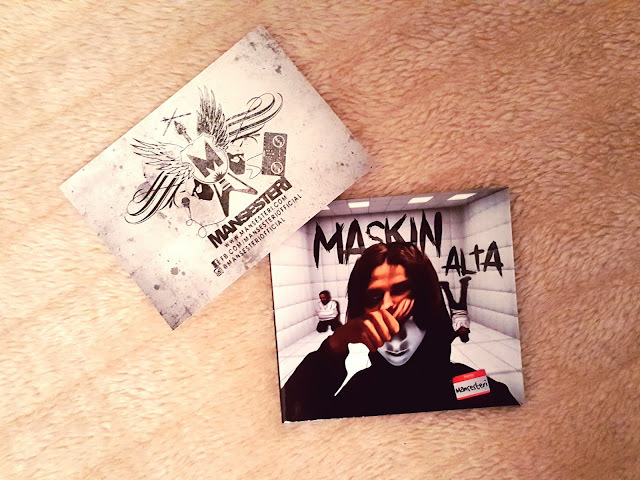 This is an English album review of Mansester's new album "Maskin alta". Check the Finnish version if it's better for you. Enjoy! This post has been made in cooperation with Mansesteri. Mansesteri is a hip hop group from Tampere, Finland. The members are Mc Mane, Vainis (Vainoharha) and their DJ, DJ Kalu. They have already 6 albums. Two of them are Gigstape-albums rechargeable from Online. In early of this year 2017, on 31th January, they will realize a new long play album called "Maskin alta" to a Levykauppa Äx (Record Store Äx), Spotify and to their own web page. 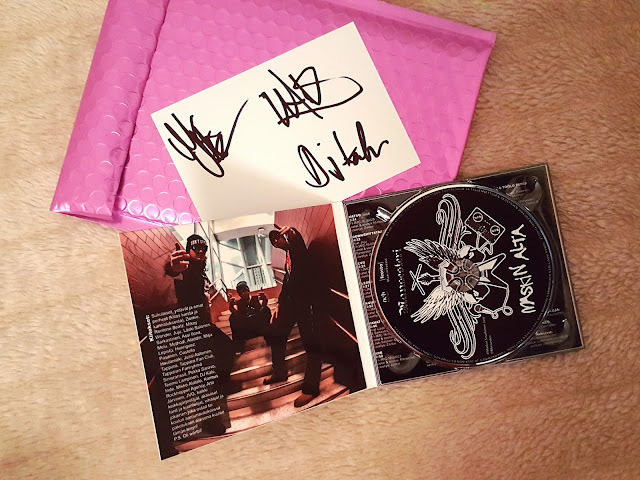 They asked me to do an album review of their new long play album and tell my own opinion about it and the songs. When I first heard the songs, I seat in peace, I put my earphones to my ears and with closed eyes I focused strictly and listened to the whole album. As a result of the first listening time, was a full paper of notes and good feelings. From the albums tracklist you can find party music as well as more deep, a story telling material. Already from the beginning I liked the most songs called Katso mua (Look at me) and Pintaa syvempään (To the deeper surface) ft. Assi Ilona. I have been listening a lot also a globally known song which have more than over two million listening times on Spotify called Saravon Pekka ft. TFC & S011. I will start this review right away from the albums cover. It's really unique, different and a thought-provoking. With a mask everything will be and may look normal, but then under the mask can be found the reality which can be even crazy. Jesse Lehtinen as known as Vainis rapped in his sentences in the opening song Katso mua (Look at me) (freely translated) "I will hide my face so I will not see anything anymore and for the first time I'm the real me.". It is bringing together exactly those thoughts where we live without a mask and where we are truly ourselves without a risk that we will have something to lose. It's chorus also supports exactly what you can find from under the mask in a fine eloquent way (freely translated) "Look at me now, through the flash of lightning. Under the mask can be found the same fragile human. When the lights are not shining anymore, no shackles in the legs. You can see it on your face, that you don't have nothing to lose." In the last years shows it was the whole gigs opening song. It's little dark and deep but the beat is immersively rock-style. It would be easy to perhaps sing or dance along with it. The whole album contains 17 songs and three bonus tracks. The song Downshiftataan (Let's Downshift) ft. Juju is a relaxed song. It's easy to sing along with it. According to Markus Savolainen as known as Mc Mane's words (freely translated) "Simplicity beautiful. Sometimes it is good to slow down with your "foot on the gas so you can keep in speed." are telling that sometimes it's good to just simple things, relax and think what is important. Otherwise you won't keep up and the going is not that good anymore. And Déjà-Vu is a party song. The beat is very good and speedy. Pintaa syvempään (To the deeper surface) ft. Assi Ilona is equality, bullying and discrimination resist song. According to MC Mane's interview to the FUM (Finnish Urban Media) he said that "We all have some kind of personal experiences about being harassed, bullied" which is true. I believe that to all of us is pretty easy to identify to the theme and message of the song. Many people is touched by this song and it raise us up to the important things. Bullying, discrimination, humans judgement, equality and wishing it to everyone and depression are in now days pretty much present all the time. (Freely translated) "More valuable than gold is inside of the humans. Every person is beautiful, I hanging on to it. People judge and only sees the scars. But they don't ask what for they are. They see a beast but not the heart in it's chest. They don't see an angel, just sparkle on the top. They see the marks in our hands only as a bad thing, they don't respect the stories behind them. Don't let people overwhelm you, even they judge. I believe in you, I believe to a better tomorrow." Mc Mane's words in the first song makes me think about my own ways to handle people.Other people's condemnation is not right. When the song have a lot of different things, different layers and feelings, the music have a gripping surface. In this song there is a lot of those gripping surfaces. The whole album contents points in its entirety is a brave telling about what you can find under the mask and in the deeper surface with a rock-style. To balance to the album's deeper essence, there is also relaxed, immersive, danceable party songs. 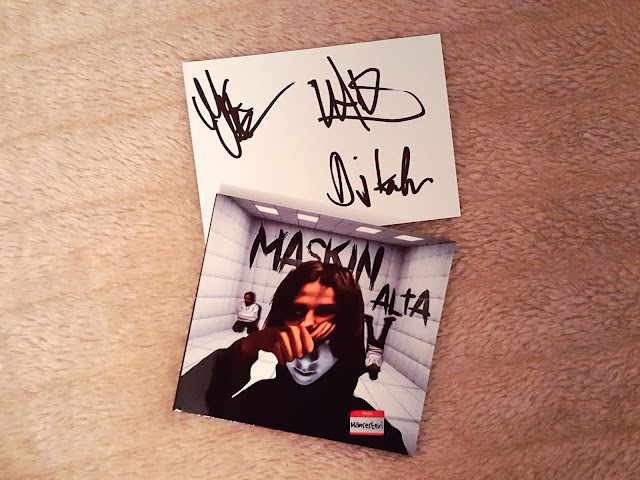 Maskin alta (Under the mask) is a uniform masterpiece from after many years and a lot of experience. I liked the whole album and it's songs a lot. I recommend everyone to listen and buy this album. The price of the album is only like about 10,00€ (euro) and it contains from the whole money enjoyable music. Ps. It was worth it!